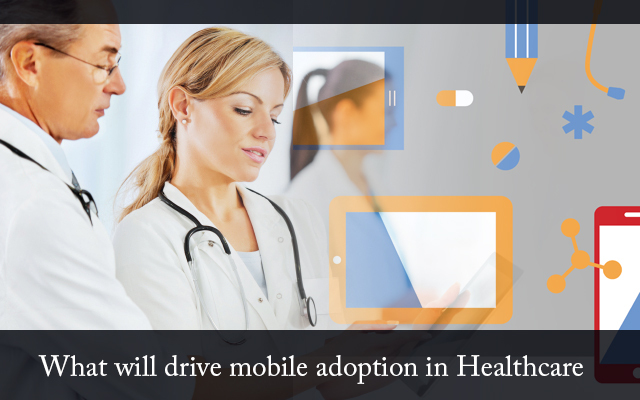 What will drive mobile adoption in Healthcare? The penetration of mHealth Technologies has been quite significant in areas like vital signs monitoring, health tracking and telemonitoring. There are enough indications to suggest that patient centric care, which is going to be the focus of the healthcare industry moving forward, will have mobile technology playing a huge part in it. However, certain important things will have to be kept in mind so as to follow the right approaches while rolling out initiatives. For example it is common place to assume that a certain breakthrough in technology will automatically get people to adapt their behavior so as to derive benefits from using it. The reality is more often than not far removed. We see that happening in health IT as well. It has been observed that more than 80% of the mHealth apps which get made are not used beyond a month. The main reason for this is that they were never designed at the first place keeping patient in mind. Design plays a very important role here. Generally good design takes in to account human factors and thus easily motivates them to use the apps. Also another thing to be kept in mind is that no matter how well designed they might be, mHealth apps cannot operate in isolation. If they are to be successful, they will need to be integrated in the workflows and made part of the care delivery system of healthcare setups. Only then would it lead to an increase in their acceptance and usage. The ubiquitous use of smartphones and mobiles has brought in a huge shift in the lifestyles of people. Healthcare being an intrinsic part of our lives is expected to undergo changes as a result of this. Thus, there is an overwhelming demand from people to gain access to their health data over their handheld devices and use apps which get them to participate in their healthcare across all important settings, namely staffed beds, face-to-face, in-home and virtual. Meaningful Use has different connotations for providers and patients. For the former, it means doing things which will result in providing quality and effective healthcare in a cost effective manner. The rewards for achieving it are in the form of incentives. For the later however, there is no need for incentives to use technology. All they want is something useful, something which would seamless merge into their lives offering enhanced convenience and value and not require them to make a lot of changes to accommodate it. This is where providers can also help but leveraging the data explosion from Meaningful Use to make sense for their patients. There is also this section of people from the industry who are keen on giving the use of mobile technology in Healthcare a bit of more time before jumping onto any conclusions related to its benefits. These are industry veterans and have seen many such interventions in the past which were reckoned as path breaking but ended up falling miserably short of expectations in terms of actual benefits; in the case of a few the outcomes were even detrimental. One such expert feels that there is potential of mobile technology helping two broad areas i.e. management of chronic diseases and diagnosis of acute illness. Besides the obvious benefits, it will eventually result in reducing the number of unnecessary visits of patients to physicians and increasing convenience tremendously. Thus, moving forward the aim is to reach a stage where hospitals would be needed only for intensive care, operating rooms and pre- and post-operation recovery purposes. Indirectly it would also go a long way in reducing the risk of infections resulting out of frequent visits to hospitals. Finally, the success of mHealth depends a lot on how evidence gets validated over the next few years on its effectiveness. Because it is new age it does not necessarily have to be the correct or define the future. Rather than illusions, it will require those hard found facts, collected over a reasonably long period of time, to propel its acceptance and eventual success. Also, a certain degree of regulations will need to be in place to avoid some well-intended apps and devices ending up being dangerous. Healthcare mobile app development teams can help you build projects within allocated budgets and time schedules. We provide healthcare it services. If you would like to get your application tested by our certified healthcare software testers, please contact us at Mindfire Solutions. This Post was posted in Health Care and tagged Dedicated QA team India, develop computerized physician order systems, develop medical information system, emr software development india, healthcare it services, healthcare mobile app development, healthcare software developers, healthcare software development, healthcare software testers, offshore healthcare development. Bookmark the permalink.